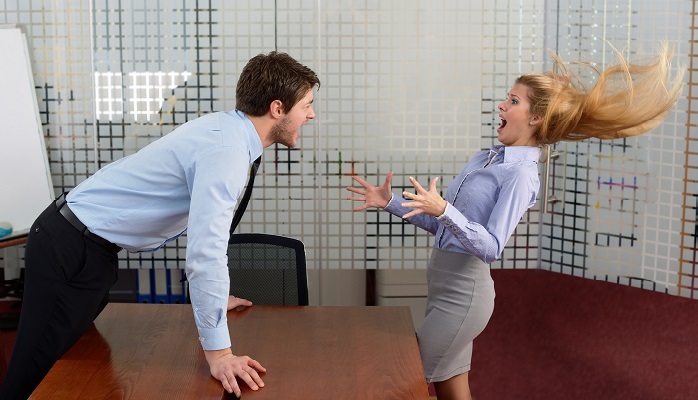 Do you dread the thought of giving an employee constructive feedback about their work? You’re not alone. Most managers think that if they address performance issues head-on that they’ll only make matters worse. They either say nothing, sugar-coat the message beyond recognition or delay the discussion until annual reviews. When you delay or deny constructive feedback, everyone loses. It’s not only detrimental to the employee’s development, it’s costly to your business too. The paradox about constructive feedback is that your employees hate these conversations as much as you do. But they need this feedback to grow in their careers, and you need to address problems to ensure your business stays productive. Before you sit down to discuss an employee’s performance, think about it beforehand. It seems obvious, but I can’t tell you how many times I’ve seen managers try to ‘wing it’ during these meetings. It becomes instantly obvious that they haven’t done their homework. Your employees will pick up right away whether you’ve prepared or not. Taking the time to gather facts and knowing what exactly you want to say beforehand, will help you stay on track during the meeting. The preparation time shows that you genuinely care about helping the employee to improve. This simple step will go a long way in building trust and respect in your relationship with your employee. Constructive feedback should always be done in private out of respect for the person. Ideally, you want to talk to them as close to the event as possible. This way you can ensure that it is at the forefront of everyone’s minds. It’s difficult to discuss proactive solutions when you and your employee can only vaguely recall the event. The only exception to this rule is when emotions are running high (either yours or theirs). In their book Crucial Conversations, Kerry Patterson and Joseph Grenny tell us that when our emotions are high, we are physically incapable of giving or receiving feedback. It’s always wiser to wait until tempers cool, maybe a day or two, but no longer than a week. Keep in mind, you only want to talk about one or two concerns at a time. If you dump a grocery list of complaints on the person, this comes across as sounding like a rant, and your employee will most likely become overwhelmed, shut down, and defensive. Starting the conversation with the facts is less confrontational than beginning with accusations or assumptions. For example, you say to me, “I noticed that you were 20 minutes late for the yesterday’s meeting.” Assuming your statement is true, I can’t dispute the facts because they are specific and based on your observations. A word of caution, try to stick to the facts that you’ve seen firsthand. It’s always a slippery slope when you base your feedback on someone else’s observations. To avoid sounding accusatory, don’t say “you” instead insert “I” or “we” when describing your concerns. Also, don’t use generalizations such as “never”, “all” or “always”. You’ll find people become much more open to feedback when you stick to the facts and discuss the impact that they’re having on the rest of the team. The idea is that we want to check our egos at the door for these conversations. Don’t be vague when sharing your thoughts, sugar-coating or sandwiching tends to just confuse people. Clearly state your concerns, for example, you could say “I’m concerned about your reliability”. When you speak with honesty and respect, you can get almost anything. Giving constructive feedback is about having a conversation where both of people have a chance to be heard. If the employee spends the entire time sitting there looking at their shoes, chances are you are lecturing not dialoguing. Create open communication by saying your comments and then asking for their thoughts. This gives everyone the chance to have his or her say. Once we feel heard, then we become open to change. Some people will be reluctant to share their honest opinions with you, especially if you’re the boss. You want to try to make them feel that it’s safe to share their thoughts and opinions, even if they contradict your own. Paraphrasing is a helpful tool to show that you are listening. You may not necessarily agree with what they are saying, but make them feel it’s safe to speak candidly. Resist the temptation to interrupt or defend your point of view while the employee is speaking. After you’ve both have had a chance to speak. Ask the person for their suggestions on how they think the situation can be improved or resolved. You increase the chances of them following through on their commitments if they have had the chance to give input on the resolution. During the meeting write down everything that you and the employee have committed to, don’t leave anything to memory. This document becomes your action plan and your written proof of what everyone is accountable for. You also want to setup a follow-up meeting in a week or two to discuss the status of the employee’s development. Many managers skip this step and then wonder why they don’t see any improvement. By holding someone responsible and following up with them, you immediately increase their motivation to honour their commitments. For feedback to be effective, it must be given frequently and consistently. By giving regular feedback, the process becomes free-flowing and natural. Providing both positive and negative feedback on an ongoing basis is a great way to build trust with your employees. These conversations can be the most important communications you will have with your team! Question: Why do you think it’s so difficult for us to give and receive feedback? Please leave your comments below. Are you planning to create or update your employee handbook? Our FREE Ontario Employee Handbook Checklist will walk you through the process. The checklist includes a list of all the required and nice-to-have policies. If you would prefer to jump start your project, our Employee Handbook (Ontario Edition) has done 90% of the work for you. 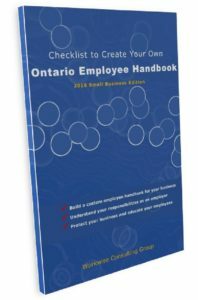 This handbook is ideal for Ontario small businesses with less than 50 employees.